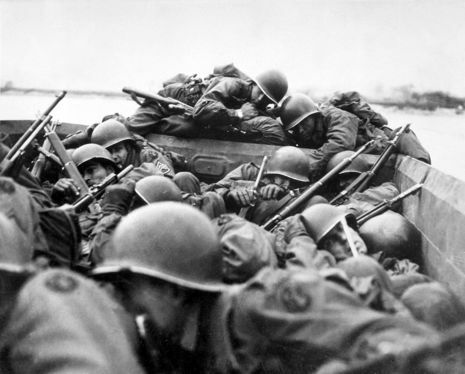 Commencing on the night of 23 March 1945 during World War II, Operation Plunder was the crossing of the Rhine river at Rees, Wesel, and south of the Lippe River by the British Second Army, under Lieutenant-General Sir Miles Dempsey (Operations Turnscrew, Widgeon, and Torchlight), and the U.S. Ninth Army (Operation Flashlight), under Lieutenant General William Simpson. XVIII U.S. Airborne Corps, consisting of British 6th Airborne Division and US 17th Airborne Division, conducted Operation Varsity, parachute landings on the east bank in support of the operation. All of these formations were part of the 21st Army Group under Field Marshal Sir Bernard Montgomery. This was part of a coordinated set of Rhine crossings. The initial assault took place on the night of 23rd/24th March, with the guns of 3rd and 5th RHA supporting the attack at Wesel. Three days later on the morning of 27th March 1945, 11th Hussars led the Division across the Rhine. The advance force was made up of 11th Hussars, a battlegroup of the Inniskilling's, 9th DLI, in Kangaroo armoured carriers, 'A' company 1st Rifle Brigade, 'K' battery 5th RHA, 4th Squadron RE and flail tanks from the Lothian and Border Yeomanry. There was now a change of strategy for the Division, as since leaving the Desert it had been led by the infantry, but now 11th Hussars were to lead followed by the infantry and engineers.